There are a flurry of Android apps being updated to support the new Wear watches, but perhaps none of them has as much potential for genuine utility as If This, Then That (IFTTT). The popular service-linking system just launched its Android component back in April, but they're wasting no time in jumping on the Android Wear platform. The app has been updated to include Wear support, and the service itself is adding recipes for actions started from Wear. The IFTTT blog has a post to address this, suggesting both actions that you can send to your Wear watch from IFTTT itself and actions that you can initiate from the watch. 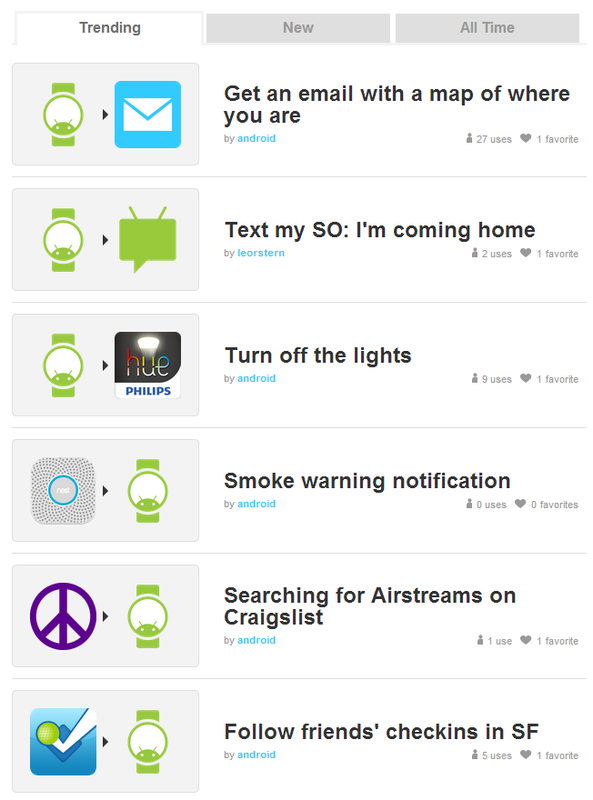 It looks like anything that currently hooks into IFTTT can be expanded into a Wear-enabled recipe, including most of the popular web tools, services, and hardware links. To see the current recipes that include functions to or from Android Wear, check out the Wear channel - there are already a dozen that have been posted, and that will certainly grow quickly. Fair warning: at least one of our Google I/O attendees who got an early Wear unit says that the updated app is force-closing on his phone, so there may be a few kinks left to work out.